Photo's are enlarged to show detail. Be sure to check measurements. Studio made "cups" or flowers are hand formed of copper. Then enamel is added and fired. This color blend I call Old Ivory. I made the cups or flowers out of a thinner gauge copper so they are still lightweight. 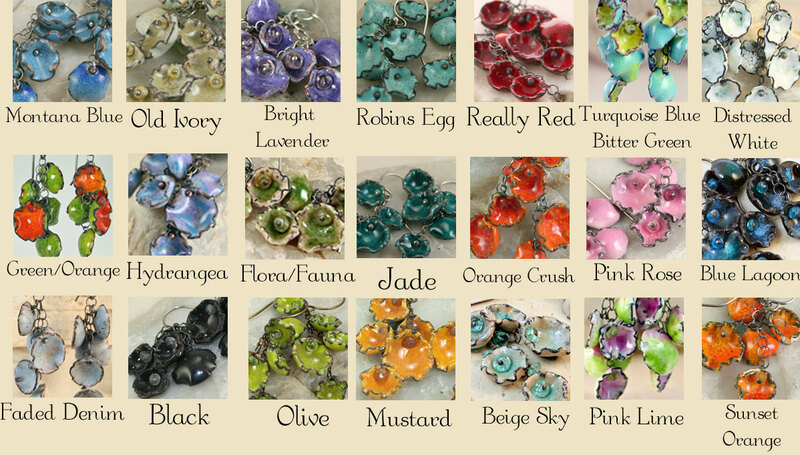 They are assembled using sterling silver and Czech beads. The silver has been oxidized for a better contrast with the enamel. Studio made "cups" or flowers are hand formed of copper. Then enamel is added and fired. This color blend I call Lime Green with Bright Orange. I made the cups or flowers out of a thinner gauge copper so they are still lightweight. 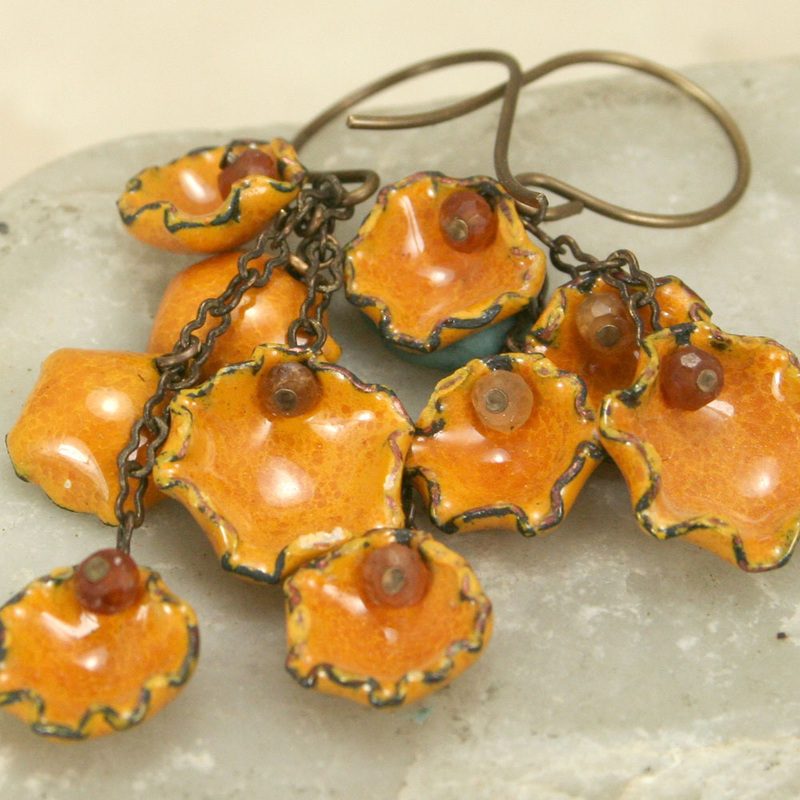 They are assembled using sterling silver and Orange Sapphires. The silver has been oxidized for a better contrast with the enamel. Studio made "cups" or flowers are hand formed of copper. Then enamel is added and fired. This color blend I call Rosy Pink. I made the cups or flowers out of a thinner gauge copper so they are still lightweight. 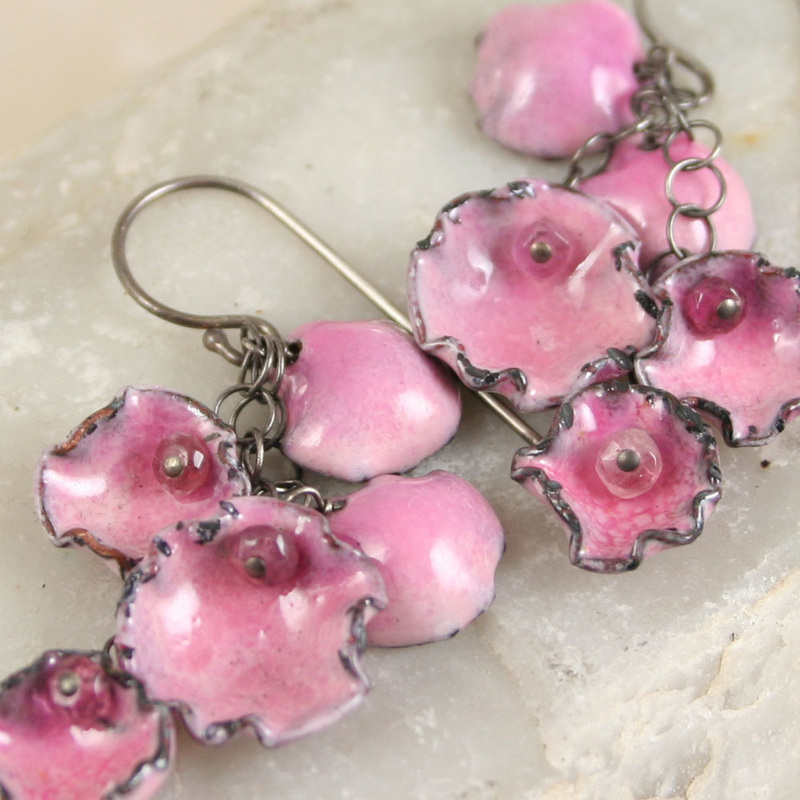 They are assembled using sterling silver and pink sapphires. The silver has been oxidized for a better contrast with the enamel. Studio made "cups" or flowers are hand formed of copper. Then enamel is added and fired. This color blend I call Blue Lagoon. I made the cups or flowers out of a thinner gauge copper so they are still lightweight. They are assembled using sterling silver and Apatite gemstones. The silver has been oxidized for a better contrast with the enamel. Hand formed "cups" or flowers of copper. Then enamel is added and fired. This is one of my new custom blends I am calling Hydrangea. It is a blend of Lavender, Orchid, Purples and Blues. Numerous shades of enamel are layered to produce this color, there are multiple firings. I made the cups/flowers out of a thinner gauge copper so they are still lightweight. 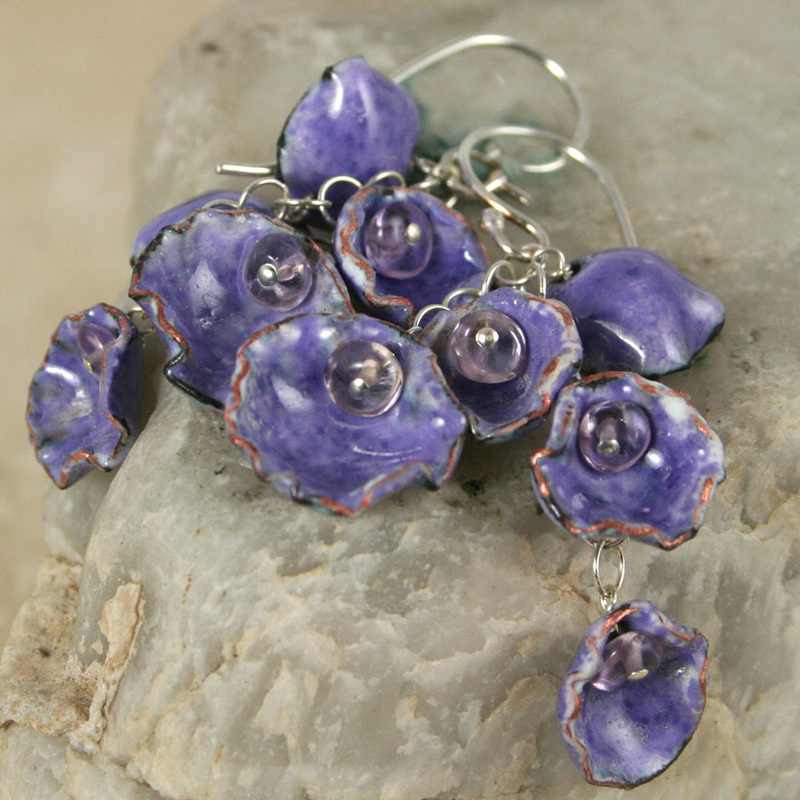 They are assembled using sterling silver which has been oxidized for a better contrast with the enamel. the headpins used to attach the cups to the earrings chain are copper. 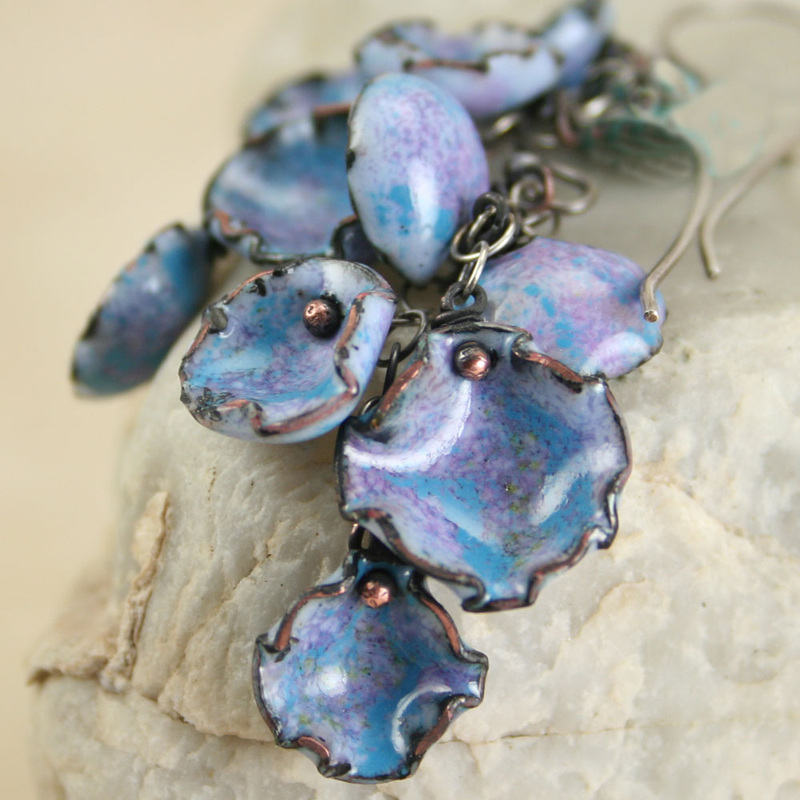 These earrings dangle to nicely and have movement. Hand formed "cups" or flowers of copper using metalwork techniques. Then enamel is added and fired. I found this color to be delicious!! I just love it! Bright Orchid/Lavender. I made the cups or flowers out of a thinner gauge copper so they are still lightweight. They are assembled using sterling silver. I used Amethyst gemstones to secure the cups. Prefer Vintaj brass of patina-ed silver let me know. Hand formed "cups" or flowers of copper. Then enamel is added and fired. 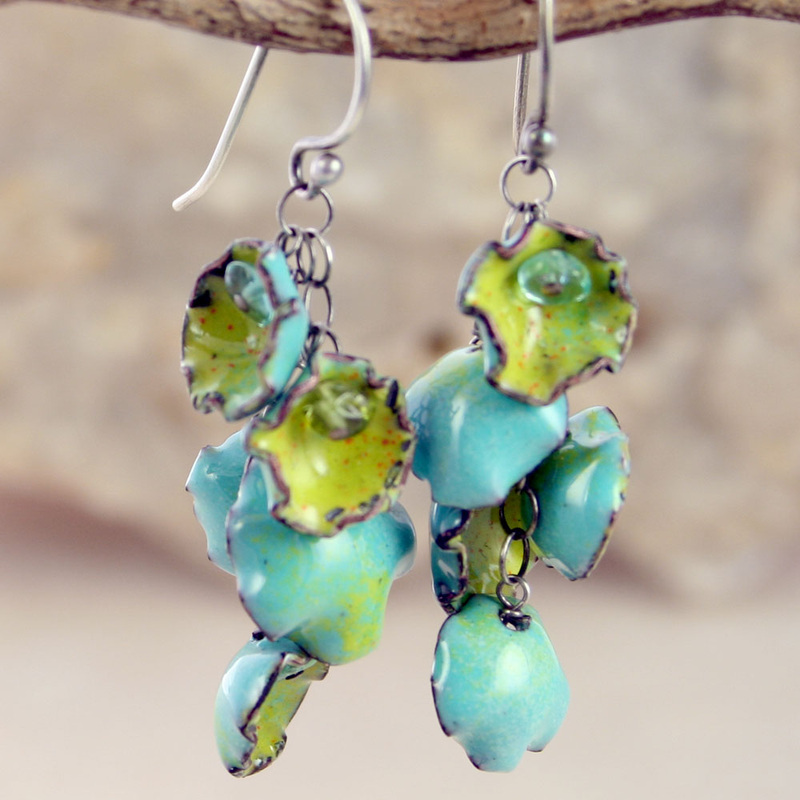 The colors for these are a bit of a twist, the inside Chartreuse, the outside Turquoise. Many many firings are needed to produce these colors. I made the cups or flowers out of a thinner gauge copper so they are still lightweight. They are assembled using sterling silver and tiny sea blue Apatite and Peridot. The sterling has been oxidized for a better contrast. Hand formed "cups" or flowers of copper. Then enamel is added and fired. The color is beige with splashes of sky blue. I made the cups/flowers out of a thinner gauge copper so they are still lightweight. 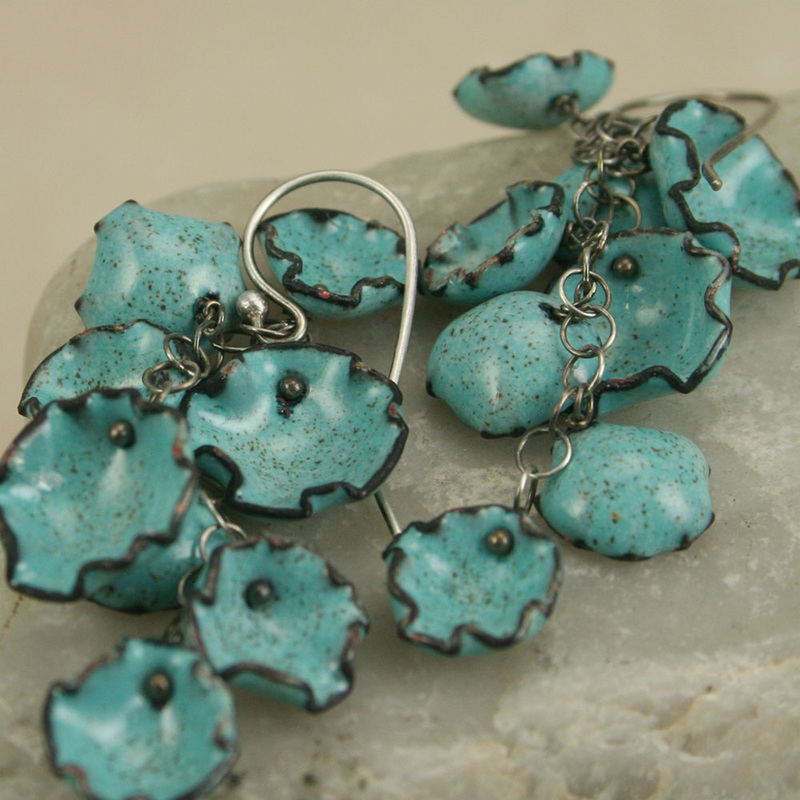 They are assembled using tiny Sky Blue Apatite and sterling silver which has been oxidized for a better contrast with the enamel. Just for fun I added a tiny apatite stone here and there in addition to those used to secure the cups. As a warning....Apatite is a very soft stone so don't wear while cliff diving. Hand formed "cups" or flowers of copper. Then enamel is added and fired. 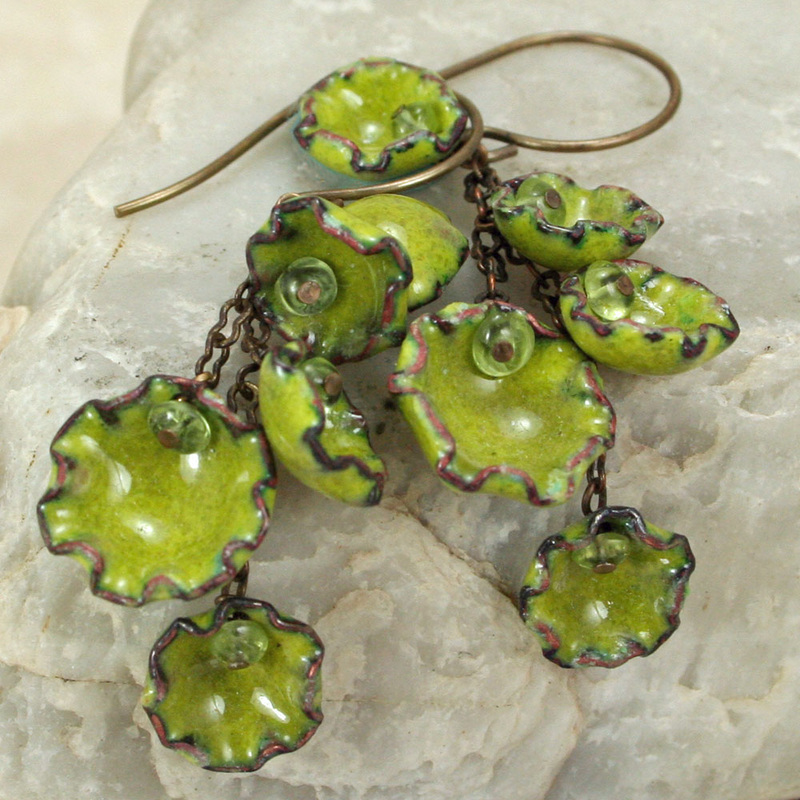 This color is layers of various shades of blended lime green with pinky-rose in the center of the cups. I made the cups or flowers out of a thinner gauge copper so they are not to heavy on the ears. 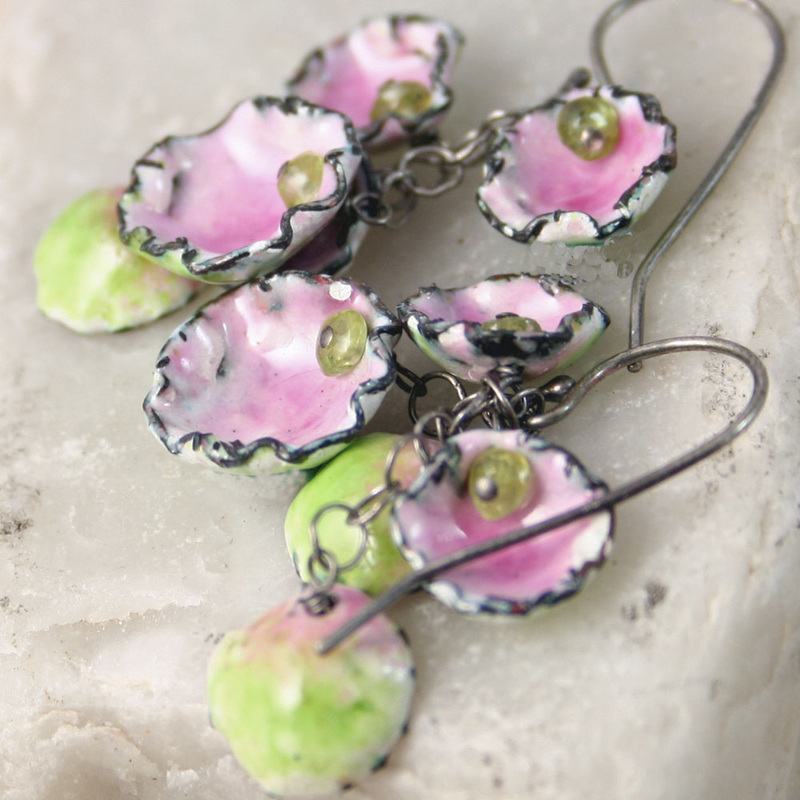 They are assembled using sterling silver which has been oxidized for a better contrast with the enamel. Hand formed "cups" or flowers of copper. Then enamel is added and fired. I finally found a blend that satisfies my quest for a Good Mustard! I made the cups or flowers out of a thinner gauge copper so they are still lightweight. They are assembled using genuine Vintaj Brass, it contrasts so well with the mustard. I used Hessonite Garnet to secure the cups. Prefer sterling let me know. I felt I had a hard time photographing this color. It is not orange at all but, not sure how it reads on your end. Hope you see the true color. Hand formed "cups" or flowers of copper. Then enamel is added and fired. I found this color to be delicious!! I just love it! The best Olive ever. I made the cups or flowers out of a thinner gauge copper so they are still lightweight. They are assembled using genuine Vintaj Brass, it contrasts so well with the Olive. I used Peridot to secure the cups. Prefer sterling let me know.